We take great pride in our work and are honored to have it recognized in our industry, community and media. For press inquiries or interviews, please contact Bre Hance, Principal, by email at BreHance@InHanceInteriors.com or phone at (323) 538-5912. (August 2018) Top interior designers, including InHance Interiors, dive deep with water-inspired flourishes. (February 2018) If anybody knows how to make a house a home, it’s Bre Hance. Over the past year, the owner of InHance Interiors has shared her insights and wisdom on how to make a house a home, from personalized décor to the more functional elements of a room. However, Bre will be the first to tell you a neighborhood plays a role in making a family feel at home, whether its members have been there for decades or are new arrivals. She describes her neighborhood as a sanctuary, removed from the hustle and bustle associated with LA. 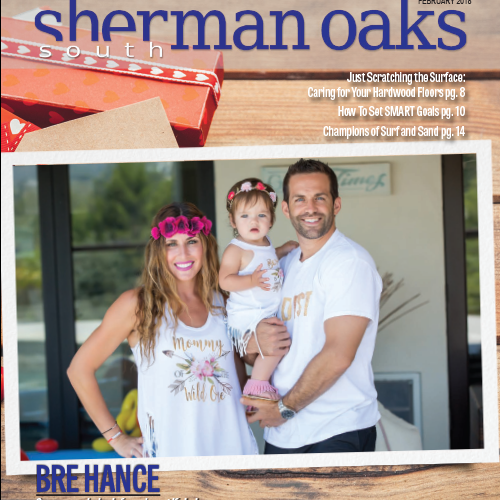 (December 2017) With both of her parents in the home building industry, Bre Hance spent much of her childhood playing in model homes. What she didn’t realize then was that she was also soaking up the foundational elements of beautiful design. It was knowledge she’d find herself using again when she started designing a portfolio of high-end homes for her husband, a residential real estate developer. “It was really more of a hobby than anything else,” she says. ADR 2017 Designer Series Lineup: Designers Making a Mark in the Interior Design Industry. (July 2017) There are some great stand outs about your Communication that I really do value and appreciate from your website! What made you take a different approach rather than solely focusing on the creative aspect, you designed a website that is client friendly and transparent with your values?